First, the last two months of my life have been kind of hectic. I finished my courses. I went to Las Vegas. I went to Lake Tahoe. I came home and wanted to sleep forever… 🙂 I had a birthday. All told, a whirlwind. Things are calmer now, so I decided to buy a new desk. No, not for my home office, but for my living room. I’ve had this monstrous L-shaped desk with shelving and storage on the side of it for approximately forever. Like, 1999. It’s served me well. I remember putting it together in my bedroom in my parents’ house. It came with me to my first apartment in 2001. And my second apartment in 2002. And, uh, I’m still here. Basically, the desk hasn’t been touched (moved, emptied, etc) in 16 years. 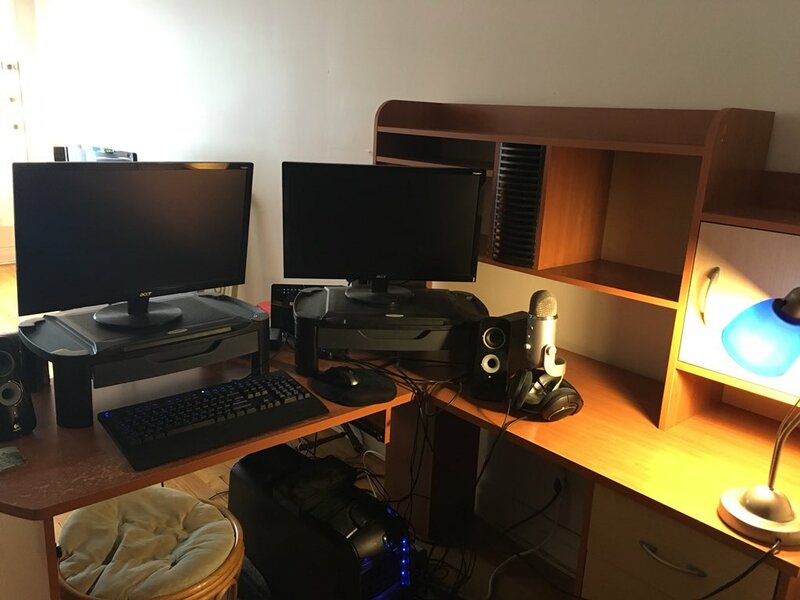 So I’ve spent the last two weekends emptying it and cleaning it, because I’m getting a new desk from IKEA (yes, the same Linnmon/Alex desk as in my office) and getting rid of this one. Anyway, I’ve been deeply nostalgic as I go through everything from old cable and phone bills to old birthday cards from my grandmothers (both of whom have passed), from old photos to old tickets to the third Harry Potter, which I saw in freaking Newcastle, England. And now everything is either thrown out (there was a lot) or stored (also a lot) or temporarily stored because I still need those items regularly. Which leaves me with the desk. Obviously, I have to move the computer stuff and lamp, which I’ll do on Wednesday, before dissembling the desk into its two major halves. It gets picked up on Thursday evening and the new desk arrives Friday afternoon. So next weekend will be me building another IKEA Linnmon/Alex desk. I’ll miss the desk. I will. I’ve had so many memories at this desk, strange as it may seem. I’ve blackjacked people over the head in Thief, I’ve conquered worlds in Civilization V, I’ve written hundreds of thousands of words here. I’ve defeated innumerable dungeons and raids and bosses in World of Warcraft, I’ve spent hours laughing as I recorded podcasts, even more hours editing those podcasts… I have spent a lot of time at this desk over the years. And I know, it’s just a desk. It’s a piece of functional furniture that I picked out and bought and assembled almost two decades ago. But the laughter and tears (don’t underestimate the emotions one can feel when writing or interacting with others online), the joy and sadness, the victories and defeats that have happened while seated at this desk are uncountably immense. While I was going through All The Things, I found a ton of old CDs with lots of data on them, too. Old versions of this very website existed on these CDs, for example. Also, old stories. Old photos. Even old videos. One day, I’ll try to pull some out and do something with them or whatever. For now, I’ll sit here, lost in thought, overcome with memories and feelings from the last 19 years of my life. Previous Article That’s All, Folks! Next Article Back to it?